Now imagine you were just diagnosed with it. Or your child. This is our story. Our family fell head over heels in love with our fourth child when we saw her being advocated for on a website in need of a family. We weren't planning on adopting again, until that moment. We were out of state, in Baltimore, having surgeries for our youngest daughter who is missing her fibula. When we received more information on this precious 5 year old, we learned we needed a specialized orthopedic surgeon to look over her file. Boy, we were in luck, face-to-face with one of the country's best. We showed our surgeon x rays of a broken tibia and fibula and he immediately recognized it as Congenital Pseudoarthrosis of the Tibia (CPT). "We got this." Then he gave us a heads up that pseudoarthrosis can be associated with Neurofibromatosis. "What? Say that again. Spell it." After a quick google search, my heart sank. So against my natural tendencies, I stayed off google and went straight to our Neurofibromatosis Clinic in Dallas. Dr. Klesse is bragged about often and recognized all over the country. She was kind enough to talk to me personally and her conclusion was she was seeing enough evidence to prepare us for a Neurofibromatosis diagnosis. My heart sank again. Honestly, it still does. Those who are familiar with Lottie knows she underwent an amputation 8 months after we met her and sports a purple prosthesis, but the part of the story I tend to leave out is her NF diagnosis. While it is scary, I follow Dr. Klesse's original advice two years ago, when we spoke before meeting Lottie, which was "The internet likes to sensationalize NF. Stay off Google." So I do stay off random internet searches and have stayed private about the diagnosis to keep other people from "googling" my daughter's disorder. For me, it's a strange and unwelcomed feeling knowing someone may be looking up my daughter's disorder and not being able to filter the sources. I never want NF to define her. I never want it to change the potential they see in her. I never want fear to rob the joy. But the reality is NF is unpredictable and as her mom, I worry. I am breaking my silence because worrying isn't helpful, but awareness is. Research is. Support is. Lottie, along with thousands of others, stand a much better chance if we can discover more about NF, find better treatments and a CURE. It all starts with awareness. May is NF awareness month and it starts with me, now. I will not be silent. The NF community has been a refreshing and enlightening source of encouragement and education. Dr. Klesse now oversees Lottie's care and we always look forward to our visits and her time. We also value Children's Tumor Foundation and Texas Neurofibromatosis Foundation for the commitment to NF. To give directly to Neurofibromatosis research, click here. To support Lottie, spread awareness & support research, consider buying "I know a NF fighter" shirt here. While this is a very small snapshot of our story and Lottie's diagnosis of NF Type 1, I hope it's valuable in opening the doors for more support in finding a cure and better treatment. Lottie doesn't let anything steal her joy and it's my hope that will never change. Keep shining on Lottie girl. Momma loves you. This week my Papa passed away. I find myself reluctant to do the social media post with a picture and caption about it all. I really can’t explain why. Maybe it just doesn’t seem adequate in regards to all of my emotions and love. I have carefully shared lots of areas of my life, particularly adoption, so I found it conflicting some, however the key word is carefully. I keep much of it private. My extended family have shared beautiful posts and I truly enjoy seeing all the pictures of him, some I have never seen before. I love hearing their words on what a wonderful man he was and smile because it’s all really true. They seem to give such honor and love in what's just a snapshot of their emotions. There’s no forgetting the bad and only speaking of the good here. He was good. I spoke to my Meme today and fought back tears as I stood in the middle of open gym today with all 4 kids, my sister and two extra kids. I have created a beautiful life with Clay, one that I dreamed about as a little girl. Clay is my rock. I just adore him. We have so much life ahead of us. I can’t imagine losing him. And I also can’t imagine being with him over 6 decades and then no longer having him. I grieve for Meme. I know sadness must flood her heart. As Christians, it seems Heaven should be a great sense of comfort, but as Meme said, selfishly his presence is missed. I grieve for my dad who watched his dad decline in health and tried to make sense of it all. I watched him love from afar and from close up. And now I watch him grieve. I also watch my mother balance loving and grieving to a family she's been with since she was a kid. I grieve as a daughter, as a wife, as a mother and as a granddaughter. I have slept a lot. I wondered if it’s a form of grief. I have been having dreams about Papa meeting Lottie or me explaining to others how he really wanted to. My Papa and Meme were such big supporters, cheerleaders and encouragers when it came to both of our adoptions. Lottie is the only great grandchild he didn’t meet. It saddens me more than I can express that he didn’t meet her. I know he badly wanted to. He would have loved her even more upon meeting her. She’s so sweet and full of smiles and giggles. I feel like he would have nodded his head in a job well done. I feel like he would have understood why we adopted again, why we couldn’t leave her behind. I regret that it didn’t happen for both of them. I love how everyone goes back to Papa being a Godly man and I go back to picturing him walking into his kitchen with a KFC bag in his hands just for me. I can smell the instant mashed potatoes and brown gravy now. He knew it was my favorite as a kid. Papa was a wonderful grandfather in both the little details and big. Too bad I couldn't say how that small tub of potatoes ended up feeding the entire city of Little Rock? ;) However if someone besides Jesus could do it, it might have just been my Papa. He also gave me one of my greatest gifts, my dad. Without Papa, my dad wouldn’t exist, but that’s not what I even mean exactly. He did something really right. My dad is unique. He invests in people. He gives generously. He’s very humble. He’s smart. He’s active. And he’s an amazing dad. I appreciate Papa for so many reasons, but the way he raised my dad and the example he set, may be the top of my list. In the last decade, I hadn’t spent much time with my Papa. He became less mobile and I became a mom of 4. A couple weeks ago, I spent an hour on the phone with my Meme and was reminded how much I enjoyed her when I was little and how relatable she is. I wish we had lived closer over the last couple decades. Papa will be missed and he loved so many and was loved by so many. I couldn’t be more proud to call him Papa. I’d like to think he’s watching Lottie now and smiling down on all the generations after him. May we make him proud. I personally came across Catrina Nowrey when I was advocating for Ramona, their daughter. I saw Ramona's precious photo on an advocacy site and just swooned over her. Ramona is deaf and I wanted her to have the gift of language so badly. I was ecstatic when I learned the Nowrey's were adopting her and could give her that gift as deaf parents. It's really been a pleasure watching her learn sign, thrive in her family and make her mom and dad so happy. I am very excited they are adopting again and glad MaeBeSew could jump on board to help. 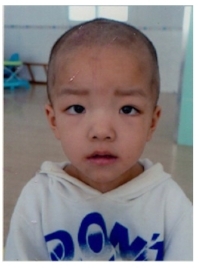 With every purchase designated for the Nowrey Family, MaeBeSew will give back 20% to their adoption funds. To support this sweet family, please enter "Nowrey Family" at checkout when shopping at MaeBeSew.com. Read on to learn more about this family. Billy and Catrina Nowrey have been married for 9 years, and are both deaf. Catrina’s had a dream to adopt from China since a teenager and she was happy to pursue a growing family through adoption. She's been open about their struggle with pregnancy and loss and how God revealed His plans to her and Billy. Now, they have a beautiful daughter from China, named Ramona, and she is deaf like her parents. Ramona is 6 years old and was adopted in May 2016. Ramona is learning sign language very quickly! They wanted to adopt another child, but were waiting until the right time. Ramona learned about families at school, and one day she came home and told her mom and dad that she wants a sister or brother! They agreed Ramona needed a sibling and started the adoption process again. They were excited to see God's plan was a brother for Ramona! They are honored to give him the name of Cody. Cody is 5 years old and deaf. Ramona is very excited and can’t wait to play with her new brother in the next few months. Billy and Catrina can’t wait to have another child in their arms and be together forever! To donate directly to their adoption funds, click "donate now"
MaeBeSew was created from an accident, so it would first appear. Later, it was clear God pushed me out of my comfort zone and created a business that would help our family bring home two of our daughters from China and continue to help our family as it has allowed me to have a flexible job while caring for the needs of our children, particularly with surgeries, therapies and attachment. MaeBeSew was never meant to be a job without meaning. Every doll is sewn with love and intention. While the dolls no longer help our own adoption efforts, they can now help other families. It is my dream and passion to see more families adopt. How can we help make that happen? Our sweet family of 5 has very exciting news. In a few months, we will be bringing home another daughter from China. We are beyond thrilled to be growing by one more and feel lucky to be able to care for another child. The red thread runs deep through this sweet story and I am excited to share bits and pieces along the way. Meet our sweet Lottie. In Clay's words, "We won the Lottie-ry." While Mei was in Baltimore undergoing her first surgery, we received the file of a little girl who my heart could not let go off. Her eyes wouldn't leave me. Her face captured my every being. She was precious. Her "special" need broke me. She has a badly broken leg due to a congenital condition and fortunately we were sitting face to face with a world renowned pediatric orthopedic surgeon when her x rays were e-mailed to us who was able to give us a clear diagnosis and help lay out what the future would hold surgically. Clay and I have learned that while medical needs are not to be taken lightly, they are a small piece to the overall commitment to a child. Children that come from hard places, a place of trauma, or brokenness can have much bigger needs than their medical ones. We've seen Mei heal and grow in miraculous ways, both physically and emotionally, and we look forward to helping Lottie thrive and grow in the same ways. It is our desire to allow her to live and be happy to her fullest potential in life with no barriers. In the words of my amazing hubby, adoption has been our family's best yes (and I agree!) and we feel very, very lucky to welcome Lottie into her forever home. She is going to be oh so loved by her sisters, brother and Clay and I! And I CANNOT wait to get her in my arms. With the paperwork done, let the countdown and fundraising begin! We have a beautiful child that needs to be HOME!! My beautiful baby sister got married this weekend and I couldn't be happier for her. She was a stunning bride and will be such an incredible wife. Her husband is handsome, funny, sincere, and loyal. They compliment each other so nicely. I truly look forward to seeing what the years ahead bring them. Through this sweet wedding, I also had the pleasure of being her matron of honor, watch Lola be a junior bridesmaid, and Mei and Ollie were the flower girl and ring bearer. I worked hard not to go into ugly cry walking down the aisle... and then as I stood in the front waiting for my sister to enter, Mei and Ollie walked down the aisle hand in hand. Ugly. Cry. I worked so hard to hold it in. But seeing that precious little girl walking so well holding her brother's hand so gently just melted me. She's apart of us. She fits right in. Then she sat curled in my mom's lap through the ceremony. Such sweetness. They are quite the pair with their matching black hair. Mei kept enthusiastically saying "I want cake!" and had to be hushed a few times. Oliver was curled in his handsome daddy's lap and Lola was spinning next to me in our matching dresses. It was just pure sweetness all the way around. Mei has come so far in such a short time. While some days felt too long, the months have flown by, as they always do. Time for Mei and us has brought on so much love, confidence, trust, security, and growth. Mei knows how much we love her, care for her and how we always come back. She has also learned that momma doesn't do drama, momma doesn't do silent treatments, momma doesn't allow much room for wussy girls, and sibling love is a must in our house. She is really trying to settle in to who she is and how her role works as the youngest in our house. At the wedding, she spent the day at school, then daddy picked her up and brought her to me late afternoon. Her day was quite busy and lacked much momma time. That night she snuggled in bed with momma just to have that extra reminder, I am always here and constant, even on the busiest of days. I am extremely proud of my babies. They did so well at the wedding. Oliver was a in a fabulous mood and for that I am so thankful. I am glad he could enjoy the day and participate. What a great memory for him. He was quite the dancer as well. Lola loves a party and danced the night away too! She was the perfect junior bridesmaid. It's so fun to celebrate a couple you are so proud of and to watch our growing family being together through it all. I really enjoyed the weekend soaking up all the extra family time. Now it's Monday, and one kid is home sick from school and it's raining. Back to black soft pants all day, every day around here.